Lighting for your CCTV pictures is crucial. So why is poor lighting so commonplace in CCTV systems? CCTV pictures all begin when light or infrared (IR) hits the camera’s sensor. IR is the same as light but its longer wavelength is outside our eyes’ range so we call it invisible. Cameras, however, generally can see both. Let’s begin with the eye-friendly visible stuff. Rainbows show all colours humans can see. Violet/blue are short wavelengths of around 400nm (nanometres: billionths of a metre) progressing across the rainbow spectrum to red at around 700nm. We are most sensitive to green light; less so to blue and red. The standard graph of this is the ‘photopic curve’. Consequently, colour cameras and IR lamps are not designed for use together. Nonetheless, when a ‘day/night camera’ switches to monochrome it physically shifts this IR filter so natural IR sensitivity is fully utilised at night. For best image clarity our lighting should enable the camera to maximise contrast. Black should appear…well…black. White should be as bright as possible. That means plenty of light on the scene, but how much is plenty? We’ll understand this better by following the light’s journey. Our source such as sunlight or an electric lamp pours rays onto the scene we’re viewing. Naturally, these spread out as they travel. So, the greater the distance to our target, the fewer the rays that directly hit it, so the dimmer it is lit. This is the ‘inverse square law’ because when we double the distance we find the reduction in lighting is doubled horizontally and vertically, thus making a loss factor of four. Some light is then not reflected because white targets might only be 80-90% efficient. Photographers use a rule of thumb that an average scene is only 18% reflective. Then these reflected rays suffer the inverse square law again when travelling to the camera. Focusing it through the camera’s lens reduces it significantly. Now you can appreciate how little of the original lighting makes it into your picture. Unfortunately, you’re very likely to be disappointed. Taking a realistic example, manufacturers’ “usable video” might mean white targets show as 30% grey. To achieve 100% grey (i.e. white) you obviously need about 3 times the light. Their data quotes an F1.0 lens. You’re using F1.6 so you’ll need 2.5 times more light. Their AGC (automatic gain control) boosts by 24dB to brighten things, simultaneously reducing clarity (signal-to-noise) from 50dB to 26dB (50-24 = very snowy). You try maintaining image clarity by limiting S/N to 40dB using only 14dB so you must compensate using 5 times more light. Frighteningly, 1 lux in their world becomes 3 x 2.5 x 5 ≈ 37 lux in yours. Of course, situations differ, but the laws of physics don’t. Beware fuzzy claims in data sheets! Clear images need lots of light. Positioning is vital. Dirt and cobwebs on housings reflect brightly and warm lamps attract wildlife. F1.0 lens can unhelpfully darken your images when reacting to glare. Cameras’ backlight compensation settings (BLC) might help. Often we point CCTV lighting in the same direction as the camera so scenes are lit front-on. Remember, you’re only going to see a silhouette and lose details if lights are behind your target (e.g. daylight in a doorway). For useful images the brightest and darkest parts of a camera’s view should be within its ‘dynamic range’. Put practically, try and keep the evenness of scene illumination no worse than 3:1 with normal cameras. Matching the spread of light with the camera’s field-of-view is a fine goal. Computer-based modelling with free, powerful software such as www.relux.biz can be extremely useful. In 2013, wide dynamic range (WDR) cameras are increasingly common but be warned they do not remove the pitfalls of careless design in CCTV lighting. At night the colours we perceive can be greatly influenced by colours emitted by our light source. Compared with perfect daylight, tungsten/halogen lamps give excellent ‘colour rendition’ but running costs can be high. ‘White light’ approximations from metal halide, fluorescent and LED lamps are good and more energy efficient. ‘Orange white’ from high-pressure sodium lamps is commonplace but colour rendition is worse. Cameras tend to have AWB (auto white balance) active but this doesn’t correct poor colour rendition. Low-pressure sodium lamps are very efficient and commonplace but emit only one colour, yellow, so distinguishing colours is impossible. The same is true of infra-red light which is used with cameras in monochrome mode. Beware, a target reported wearing dark jacket and light trousers under IR light might under visible light appear the opposite – light jacket and dark trousers – because materials reflect wavelengths differently. Wavelengths focus differently, too. IR-corrected lenses are designed to minimise any out-of-focus effects when switching from visible daytime to IR night time illumination. Especially when using non-corrected lenses make sure focus is adjusted with iris fully open (minimum depth of focus) under IR light. When under daylight the iris shrinks and the increased DoF should reduce effects of focus shift. ‘Non-covert’ tungsten-based IR lamps (deep red glow around 750nm) need less correction than ‘semi-covert’ lamps (dim orange glow around 830nm) and, again, less than ‘covert’ lamps (nearly invisible glow of 950nm). Cameras’ sensitivity to IR drops as wavelengths increase so more IR light is needed (in watts/m2 rather than lux) to produce your image. Field trials are strongly recommended rather than relying on a manufacturer’s vague estimates surrounding IR performance. LEDs will, doubtless, continue to advance the world of CCTV lighting, both visible and infrared. For instance, flood lamps are improving in output, and some dome cameras now carry lights rather than rely on separately mounted arrays of static lamps. Lighting design has for a long time been a dark art, literally and figuratively. 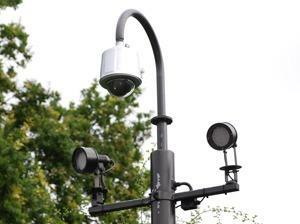 Often CCTV lighting isn’t so much badly designed as not designed at all, relying on what is already in place. I hope a light bulb has just come on above your head signalling some new ideas. CCTV Lighting Guide Lighting for your CCTV pictures is crucial. So why is poor lighting so commonplace in CCTV systems?